Want to learn fire making basics? Because I’m going to reveal simple but effective ways you can build a fire in 5 minutes or less. Now then…let’s get to it! Sometimes when you hike with your friends, you need to use some fire making skills. Not everyone knows the art of fire making, so it’s a great thing to learn, especially when all you know is to put some flammable liquid on sticks and call it a day. There are simple steps you need to follow when you try to make a fire. Once you learn these steps and start practicing, you’ll get better at fire making in no time. Then you can make campfires whenever you need to. 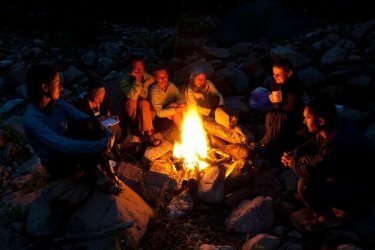 Sometimes they’re great while you’re hiking, but other times you might just want to relax with friends around a fire. Just make sure you have a plan so you don’t embarrass yourself, or start a fire that is not safe! Now that you know these key points, how do you use fire making skills to build a campfire? The biggest things to remember are building safely and starting the fire gradually. If you are patient and set up your fire properly, you should be able to get a nice flame going. Just make sure it’s not the kind of fire that could cause a problem for others! Don’t build fires in dry areas, and make sure to have water on hand if you need to put the fire out. Those general ideas are great for people who were in boy scouts or the military, but with that said, how do you actually build a fire? The keys of good fire making come from letting the fire have proper airflow and building the fire in the right order. If you understand these ideas, it’ll be easy for you to build a fire. Just remember that fires need heat, air, and fuel, but in the right order and at the right time. How Do You Actually Start a Fire? You need an oxidizer and a fuel, and usually that means air and water. Some chemical fire starters can work as fuels and oxidizers, but not everyone has those handy. In fact, according to chemistry, you can even have a fire without air or oxygen at all, but that’s not something you will get when you’re out in the woods. If you stop here and just wave a stick around in some air, it won’t catch on fire. You aren’t done yet! Once you have the air and fuel, you need the heat: that’s what gets the fire making started! The heat comes from an ignition source, which could be your lighter, or matches, or a flint. This need for heat is another reason why you can’t burn wet wood as well as dry wood. In order to get wet wood to burn, the fuel needs to use energy to dry the wood out, and that means less is left over to give off heat. Avoid this problem by grabbing the driest fuel sources that you can. All of these pieces are great, but unless you can think of a way to get the fire going, you’ll be stuck. Usually the heat and ignition source are the same thing once the fire starts, but make sure there’s a way for the fire to keep burning. When you think about setting up your fire, you have to remember surface area. Since fire is a chemical reaction, you need to combine all the pieces carefully. Without enough surface area, the fire will not get enough air, and it will not burn well. Fires without enough air burn down and go out. Once you know this fact, you should think about the best way to prep your fuel. Since you know that fire needs a lot of air and surface area, what does that make you think about? Chopping things in small pieces and leaving room for airflow! In order to have a roaring fire, you’ll need to have plenty of airflow and lots of circulation. The more air that you can get going through the fire, the better that it will burn. Leave plenty of gaps between fuel pieces. Now, think about the mechanics of building your fire. The right kind of fire making strategy involves lots of dry material, lots of air, and different sizes of fuel. You need a balance between quick burning fuel and slower burning fuel, or else your fire will go out. Seeing smoke also means that your fire is in danger of going out, because it is not burning efficiently. But have you ever stopped to think about why fires work like this? You can’t just set something on fire and hope that the rest of the flames will catch and keep burning. The right kind of fire has lots of dry material of different surface areas and lots of airflow. You probably know this from your own experience: lighting a piece of paper on fire may mean the paper burns quickly, but what is left over? Not much other than ash, and definitely not a dependable fire. You’re missing the right combination of materials. There are four levels for your fuel: the ignition source, the tinder, the kindling, and the fuel wood. All of these levels are essential when you want to put together an awesome campfire. First, you need to get your ignition source, and that means anything that can throw off a spark. Whether you’re using matches, a fire starter, a lighter, or some other source, you need to use this source to start a spark, which will set the tinder on fire. There are all kinds of different materials that you can use, like a magnesium fire starter, or even some accelerants like gas or lighter fluid. What’s the tinder? It just means anything that burns really easily. This could be dry leaves, grass, pine snaps, or other tiny twigs. Essentially, tinder means any tiny thing that you can use to start a fire. The kindling is the next step up with your fuel. Kindling means small twigs that burn a little slower than tinder, but still aren’t bigger than your finger. These pieces shouldn’t be small enough to start burning on their own once they touch a spark, but they should light on fire pretty easily over the tinder. Fuel wood comes next. Get some big and small logs when you need your fire to get going. Add the small logs to the kindling until they catch, and then slowly feed in larger logs. The fuel wood is what keeps your fire going and adds heat to the fire, so it’s extra important to find plenty of fuel logs to add on. In a pinch you can burn smaller pieces of wood, but that won’t really help your fire turn into a roaring blaze. Stock up on fuel logs ahead of time, and that’ll get your fire making skills sharp! How About the Fire Pit and Campsite? What about where you build the fire? Did you think of the right place? If you aren’t using a small solo stove, you’ll need to make space for a traditional campfire. This is an important step, because the foundation is what keeps your fire safe. The location of the fire is a key part of the fire making process. You don’t want to start a forest fire, so make sure the ground is clear of dry leaves. Pay attention to the wind so you don’t get smoke in your eyes. You also want to have tinder and kindling handy to feed your fire. Or course, you also need to have plenty of supplies by your fire, or else you’ll have to do a lot of sitting and standing before you reach your goal. Another thing to think about is how warm you need to be, because the fire does do a good job of giving off heat. If you can build a reflective back for the fire to direct the heat, you’ll have your own personal heater! Do you want to build your fire right on the ground? It depends. If you find some flat rocks to put on the ground, your fire won’t lose as much heat. But make sure not to use rocks from a river, because these stones can crack if you put them in the fire. Maybe you can’t find any flat rocks. In that case, make a mound of dirt for the fire. Elevate it a little bit so water doesn’t get into the fire and so there is enough airflow. Putting rocks around this mound will help keep the area tidy. Also, make sure to think about why the foundation matters anyway! If you build your fire right on the damp soil, a lot of heat will get sucked out to dry out that soil, and you won’t stay as warm. That completely defeats the purpose of the fire, so you will need to find a way to build a base for the fire. Make sure there’s no way for water to flow under this foundation. If it looks like you’re building on a dry stream bed, stop and rethink your fire plan. Always leave extra rocks underneath the fire in case it rains and the soil gets too wet. Once you get your fire area ready, you should put down your tinder. There’s never too much tinder! Any kind of small burnable material, like cotton balls, paper, dry grass, cattails, or more can help get your fire off in a great way. Depending on how large you want your fire to be and how much kindling you have, you’ll need to put down your tinder accordingly. Usually more is better, so make a big nest of tinder so it can catch the perfect spark. Then put down the kindling. A good way to continue the fire making process here is to lay down a row of twigs on the tinder, and then another row across that row, making a grid. The kindling is another important step, but some people make the mistake of putting way too much kindling on their fire pile. That breaks the important fire cycle! When you use your fire making skills, remember not to block all of the tinder. Your fire needs a good air flow to get going and to grow. Once you have that kindling down, start making a teepee around the rest of the tinder. You can even skip making the grid of kindling if you don’t have enough, but leave room for air! Now your fire should look like a big ball of tinder in the center with some kindling around it in a teepee shape. If you see something that looks like that, you’re on your way to great fire making skills and an awesome campfire. Then you want to get your fuel wood. Make a pile of it near you so it’s on hand when you build up the fire. Make a log cabin around the teepee with your smaller logs. Leave room for air, as always, as you practice fire making skills. Now it’s finally time for the fire making! Get your ignition source and light the tinder. It should burn evenly, and you can blow on the tinder to help get it going. Some people even fan the fire at this point, just so they can be sure the sparks catch on the tinder. The next flames should start to consume the kindling, as long as you left room for the air flow. From then on, use your fire making skills to just keep feeding your fire. Sure, it’s great to use your fire making skills to start a roaring campfire, but what happens next? Maybe you’ll sit around the fire with your buddies and have some drinks or roast some food, but someone always has to keep an eye on the fire. If you were smart and put a large pile of fuel logs by the fire, you should not have to get up a lot to keep the fire going. Instead, you can feed in the new fuel when the fire starts to die down, and it will stay strong and keep you warm until late in the night. Never ever leave the fire alone while you go do other things, because it will start to flare up and could cause serious damage while you are gone. If for some reason you do have to leave, make one of your friends stay and be in charge of the fire until you return. You should always keep extra water on hand in case you need to put out any kind of fire that escapes the fire foundation. Otherwise, you risk starting a forest fire or getting hurt when the fire gets out of control, and that’s a great way to ruin your evening. Next we’ll talk about putting the fire out. After you have showed off your fire making skills, your friends might want to practice fire making on their own. That’s great, as long as you take the time to learn about the right way to put a fire out. It’s not as fun as building a fire, but part of the fire making process involves cleaning up your mess and making the campsite safe for others. In order to put a fire out safely, you will need to have plenty of water around and some sticks for stirring the ashes. However much water you have, you should go get even more. Fires are tricky to put out all the way, and you will need way more water than you anticipate. This is the step that most people forget, since they’ll just dump some water until they can’t see flames, and then they will leave. In fact, this is a horrible way to put out a fire, and it’s not even very effective in doing so. Your first step should be to poke around the fire with a stick, trying to break up any large logs still on fire and seeing where the hot spots are. Once you have started breaking down the fire, use your fire making smarts. What does a fire need? Fuel and oxygen are both important, so you want to get rid of the fuel and block out the oxygen. While you keep poking and prodding with your stick, start pouring water over the hot spots in your campfire. This might not be as fun as the fire making process, but it is essential if you want to leave the campfire safely. The combination of water and stirring the ashes is going to bring up a lot of steam, but it should also help turn the hot wood pieces into colder clumps of ash. It may be incredibly steamy at first, but if you keep stirring you can redistribute the water and undo the fire making process. Keep repeating this process of stirring and adding water until you see no more smoke coming up from the fire. In fact, add on another bucket of water because there’s probably some smoke you have missed. You can never add too much water when you try to undo the fire making process. After there is no more smoke, you’re almost done with the fire making (and unmaking). The next step is to tidy up the fire site so it looks nice for other campers, because no one wants to get sooty from someone else’s campfire. Once you have finished that and made the campsite look neat, you are free to go on to the next adventure. While it might seem intimidating at first to start a fire, using these tips can help. Getting all these ingredients together will help you build an awesome fire. Safety is also important, so you need to make sure that you start the fire in the right place and keep an eye on it. Nothing’s worse than an out of control fire! If you stay safe and use the right fuel in the right order, your fire making skills will even impress your friends.